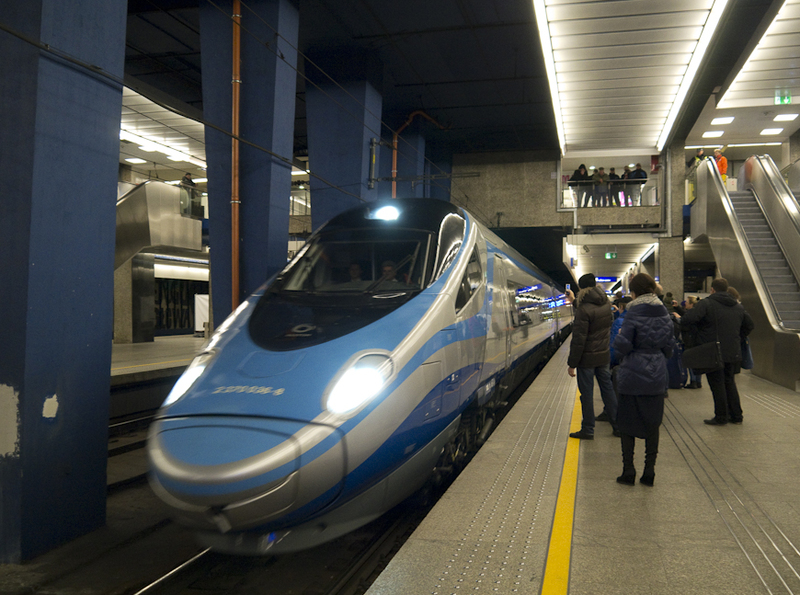 Polish Pendolino – a cautious step forward, or too little too late? 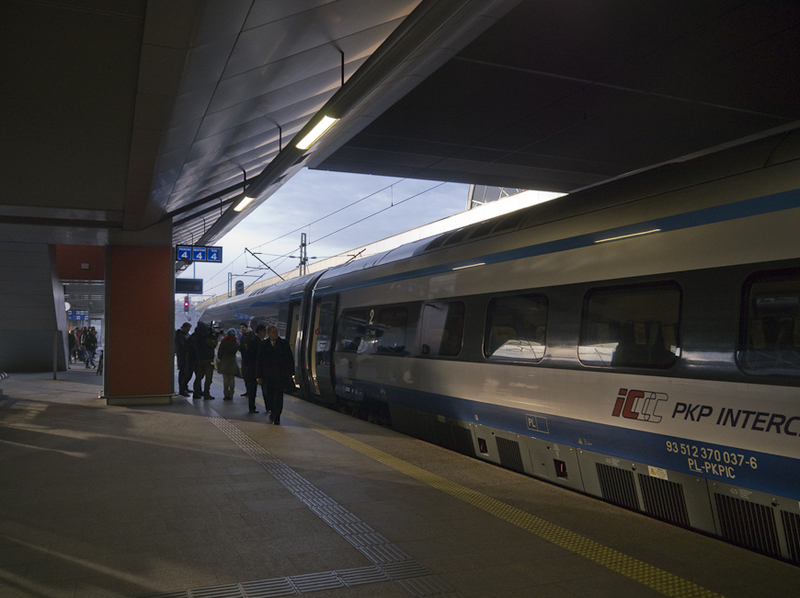 Dyspozytor travels on the first public service Express InterCity Premium (EIP) ‘Pendolino’ train from Warsaw to Krakow on 14 December. Over half an hour to go before the first Warsaw to Krakow Pendolino departs – time for a coffee and a roll in my favourite coffee bar at Centralna. Photo BTWT. I am impressed, but not excessively so. The 2nd class seats are comfortable, though a tad narrow for the classical Polish male derrière. Acceleration out of Warszawa Zachodnia – gentle yet sustained – is comparable to the diesel-powered HST125s out of Paddington (after they were throttled back following the Ladbroke Grove crash) though to PKP’s credit there is no appreciable slowing down through the Zyradow modernisation area, where delays have been the rule for over a year. I cannot find an Internet signal, but there is a double power socket in the space between the seats. I have to have it pointed out to me as my left thigh is obscuring the location. 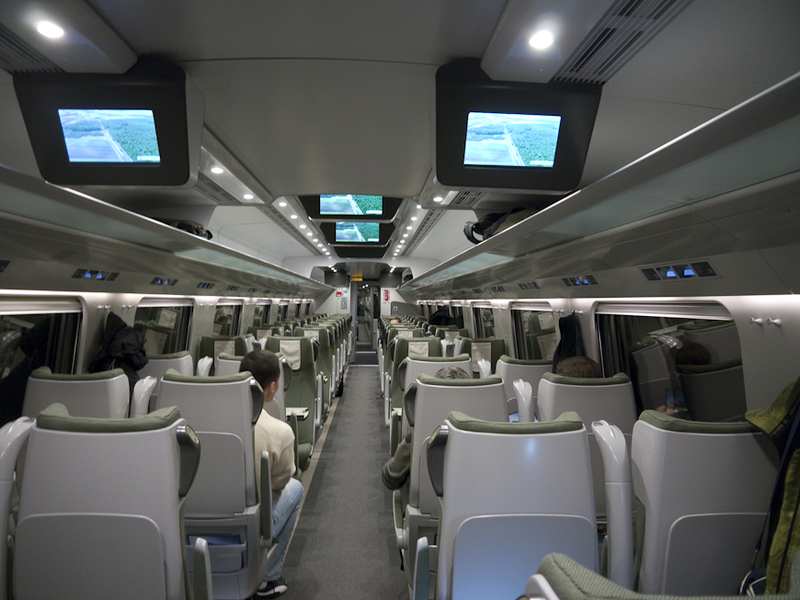 It seems that the same approach has been made as regards the inter-seat spacing as on the notorious PESA Bydgostia EMU’s – a narrow body shell has been fitted out with 2 + 2 seating and a gangway wide enough to run a wheelchair from one end of the train to another. I have difficulty in believing that such a wide gangway, and the consequent narrow seats and ultra close inter-seat positioning that results, is really required to comply with EU directives. 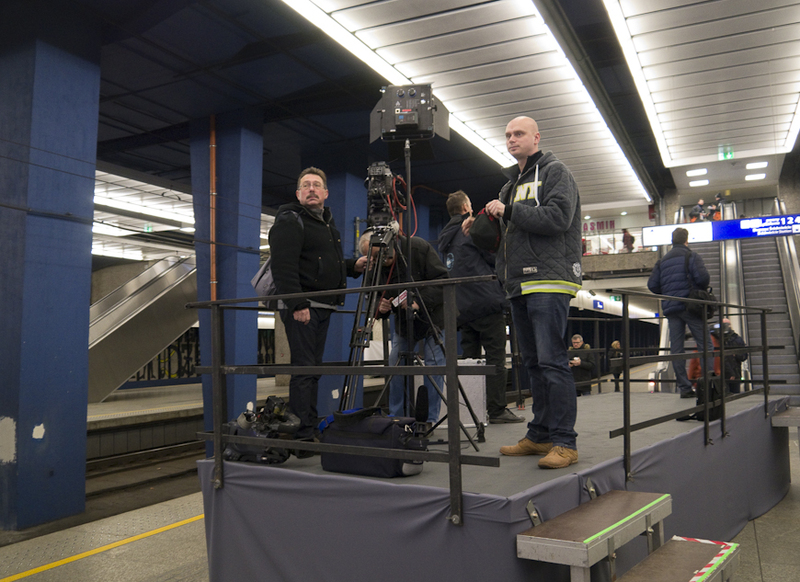 On the platform at Centralna there is an impressive platform, but it is only for TV news crews – there will be no speeches. Photo BTWT. We change tracks vis a facing point at approximately 60mph and I am impressed with our coach’s steadiness as its Alstom Pendolino bogies negotiate the pointwork. The ride is very good, though I am annoyed by the low-frequency rumble occasioned by the welded track joints. 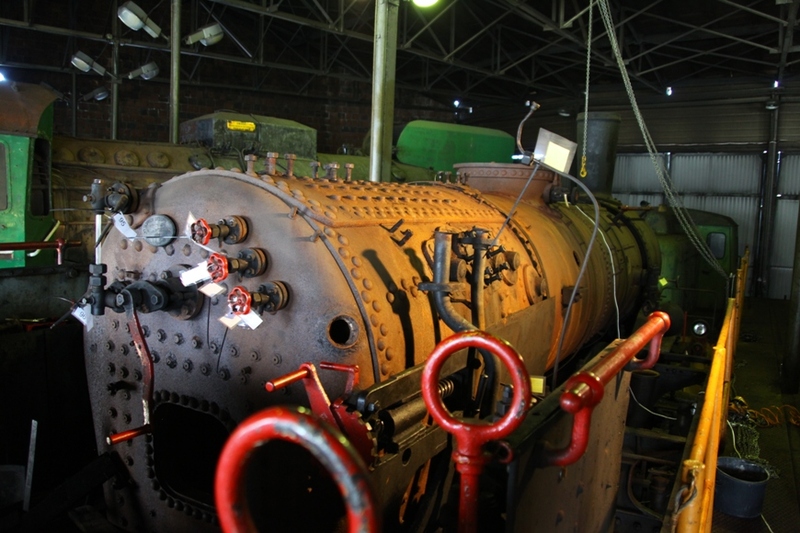 Polish rails lack the near perfect alignment achieved in the UK and, apart from a few high quality sections, each welded rail joint is felt in the coach as a slight bump. I am frustrated by the quality of information provided to passengers. In Warsaw a female voice on a recorded loop announced some 30 times that passengers attempting to travel WITHOUT a ticket and seat reservation will be fined 600 złoty (approx. 120 GBP). This seems somewhat excessive both as regards frequency of the announcement and also the size of the fine, especially as 90% of the seats are empty and journalists and PKP staff seem to outnumber fare-paying passengers. 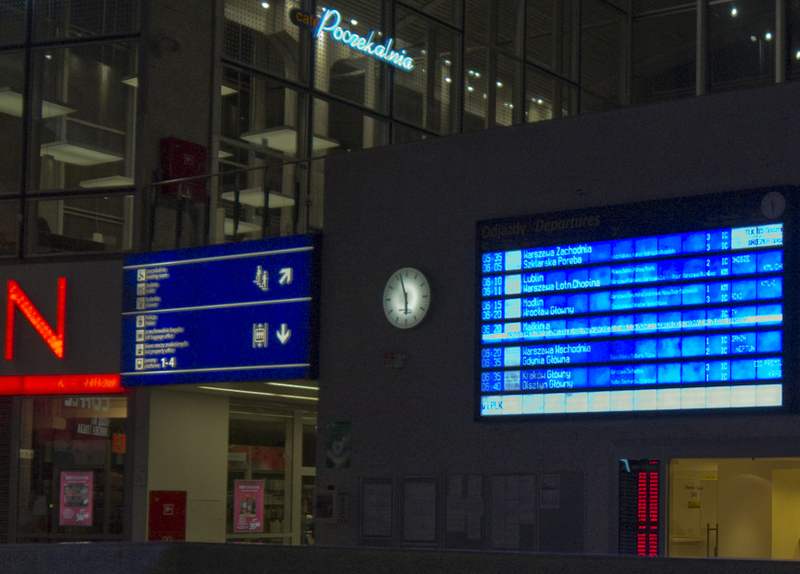 The LED travelling information ribbon panel at the end of the coach is stuck in an endless loop announcing alternatively: first, that the next station will be Krakow Glowny and then, that the remaining stations will be… Krakow Glowny. I had hoped for the usual more informative display with an occasional real-time indication of our speed. Our train draw into the platform, but where are the crowds of intending passengers? Photo BTWT. There are some nice human touches, the driver switches on the PA and announces aeroplane captain style that we are travelling at 200 km/h (125 mph). The track is exceptionally smooth here and I would never have guessed. However, immediately after making the announcement he applies the brakes so I cannot savour the moment for long. Our 200 km/h peak top speed took some time to build up and I conclude that Pendolino drivers have been trained to limit their acceleration and hence the current drawn from the electric supply. The Pendolino traction equipment was originally designed for high voltage (25kV or 15kV) AC electrified lines and the current drawn on Poland’s 3kV DC lines is very high. (Hint: POWER = VOLTS x AMPS.) Theoretically, two Pendolinos passing each other on the same electrical section and accelerating hard could blow the circuit breakers in the electricity sub station. The interior – very nice, but the passengers do not quite fit the seats (or is it the other way round?). Photo BTWT. We slow down for the junction at Psary and turn south passing through the site of the Szczekociny head on collision of 2012. The line begins to twist and turn and on this section the tilting package (based on research carried out by the BR Research Division in the 1970s and left off the Polish Pendolino bogies to save money) would have allowed our driver to take the curves some 10 km/h faster. With only twenty-five minutes to our scheduled stop at Krakow Glowny, we grind to a halt at Niedzwiedz. So much for our 2hr 28min run, thinks the cynic in me. Our captain comes on the intercom again to say that the delay has been factored in the timetable, and, we are still scheduled to arrive in Krakow on time. Four minutes later, a train running in the opposite direction having passed, we are off again. Resisting blandishments to sample the delights of the restaurant car, I remain in my seat throughout and tap away on my tablet writing this article. The ride is sufficiently smooth to make typing on a tablet or laptop a pleasure. Another announcement (surely too early?) informs us that we are approaching our destination and that we should check that we have collected all our luggage. 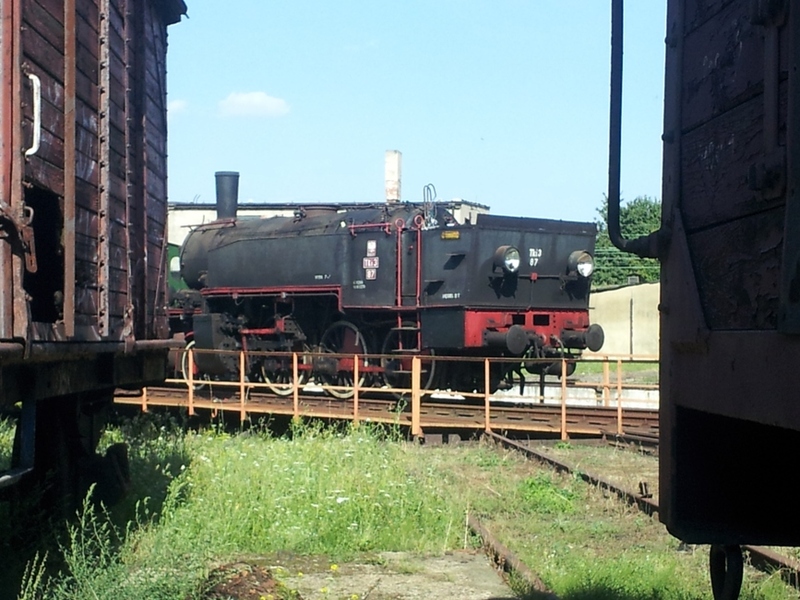 On arrival in Krakow a few stragglers pause to admire the train. Photo BTWT. We arrive in Krakow Glowny at 08:56, 2hr 21min after departing Warsaw – 7 minutes early! The (theoretically non-stop run) from Warszawa Zachodnia (Warsaw West) has taken just 2hr 15min to cover 290km – a very satisfactory average speed of approx. 129km/h (80mph). At Glowny, just as had been the case at Centralna, there is a scramble of TV cameras and journalists, but no brass band, nor ribbon cutting. VIPs, whether PKP senior executives or politicians are conspicuous by their absence. Maria Wasiak – former PKP group chairman and now as minister of Infrastructure and Development ultimately responsible for Poland’s railways – said a few days ago, no need to make a fuss, the Pendolino is just a train. However, I am cautiously impressed, and with plenty cheap discount tickets available for advance purchase, I will certainly be using PKP’s Express InterCity Premium service again.